Back in the late 1980s, Rochester John Marshall reached the Minnesota state high school hockey tournament led by a pair of defensemen, Doug Zmolek and Eric Means. They were a Mutt and Jef defensive tandem, with Zmolek a 6-foot-2 specimen already being eyed by the NHL, and Means a stocky 5-foot-8. But they both had all the tools, offensively and defensively. While covering all levels of hockey for the Minneapolis Tribune in those days, I always seemed to pick out players who might be overlooked, but whose play I admired, and I’d keep an eye on them. Means was my guy back in the 1988-89 season, when JM went all the way to the title game before falling 5-4 in overtime to Bloomington Jefferson. 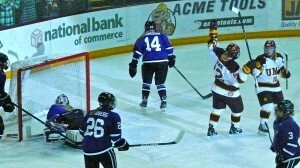 Both Zmolek and Means went on to play for the Gophers. Zmolek left early to sign a pro contract. Means, always in the background, overshadowed by bigger stars, played all four years and was outstanding. Hockey hasn’t changed a lot from those days, with almost all North American men’s hockey following the old Canadian tradition of teams trying to prove they’re better than their foes, and if they can’t do it with skill, they might try to beat on that foe physically. If you can intimidate an opponent’s players, get them off their game, you’ve got a good chance to beat them. That Canadian style, up and down lanes, dumping the puck in, pressing and hoping for a lucky turnover to get a scoring chance, and playing tough, all the time, has prevailed. Along with that, men developed some unwritten rules: You don’t try to show up an opponent, you don’t try to rub it in, and if you offend an opponent, be prepared for them to react aggressively — maybe with a bodycheck, maybe with a cheapshot, maybe with subtlety, or maybe with ugly openness. That has always been one of the refreshing differences between men and women playing the game. Nobody could have envisioned women’s hockey’s emergence, sweeping Minnesota high school girls into a new form of competition, and finding their pinnacle in college hockey, or Olympics. Bodychecking, as the men know it, is not allowed, although there is plenty of meaningful contact to stop or squeeze off a foe. Imagine a men’s game where the players had to avoid the high-speed charges, crosschecks and intent-to-injure killshots. Or a departure from the macho coach who sees his team team as less-skilled and tells his players to “run ’em!” Instead, if men’s coaches had to confront skilled teams with tactics and creativity, it might be a better game. Haley Irwin (10) congratulated Audrey Cournoyer, who scored twice in UMD's 4-1 victory over MSU-Mankato. The Women’s WCHA has evolved from a decade ago, when some of the teams had players who could barely skate, couldn’t shoot, and barely understood how to get out of their zone. UMD got the drop on the whole league by hiring Shannon Miller, a tough, aggressive woman who had coached the Canadian Olympic team that was upset by the U.S. in the gold medal game at Nagano, Japan, a year earlier. Miller and the Bulldogs won the first three NCAA women’s tournaments ever held. Miller proved to be a rare combination of a Bulldog and a wildcat, at the same time, and was clearly the best coach in the Women’s WCHA. As always, if the teams are similar in talent level, the games can be exciting and highly competitive, but UMD had to find a Minnesota, or a Harvard, or later Wisconsin, to extract its highest level of play. A decade later, the competitive level of the WCHA is better than ever. The bottom teams can now challenge the top teams — as they will attempt to prove in the first round of WCHA playoffs. Blatant physical intimidation tactics simply don’t happen in women’s hockey. Nobody raises an eyebrow if a superior team keeps scoring to the end of a one-sided game, although generally, teams don’t try to pile up the goals. Maybe making plays and scoring to the end is less of an insult than a pulling up and obviously trying not to score. 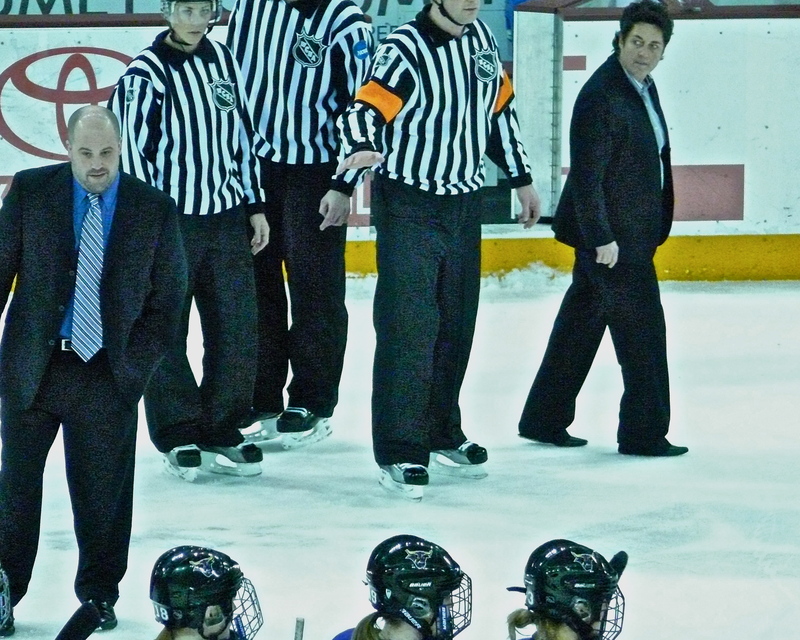 One very interesting and enormous change in the Women’s WCHA is in coaching. Of the eight WCHA teams — UMD, Minnesota, Wisconsin, Ohio State, St. Cloud State, Bemidji State, North Dakota, and Minnesota State-Mankato — seven have had a woman head coach at some time or other. The only one that hasn’t is MSU-Mankato. Of the other seven, Shannon Miller remains as the only female head coach in the league. Think about that. Nobody can criticize the job done by Mark Johnson at Wisconsin, Steve Sertich at Bemidji State, or Brad Frost at Minnesota, but it is interesting that all of these grand institutions have been unable to find a woman to coach young women. Therefore it shouldn’t be surprising that Shannon Miller accrues more criticism than all the other coaches combined. Maybe, from a league traditionally run by men and from a coaching fraternity of all men, it should be expected that other might resent the amazing success and bold demeanor of the only female coach. Usually the blend is smooth, but not always. Modern women’s hockey, and traditional men’s “by the book” hockey came to a passionate collision in the last weekend of the regular 2011-12 season at AMSOIL Arena. 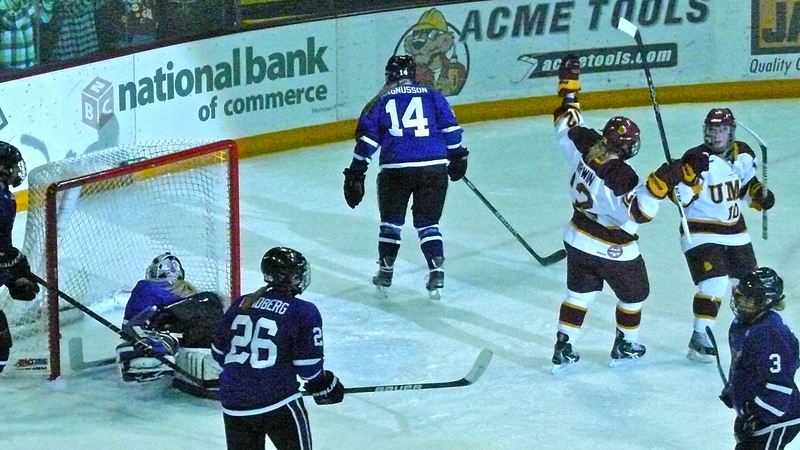 UMD’s Bulldogs needed to win to assure the fourth and final home-ice spot, and faced last-place Minnesota State-Mankato. The Mavericks are now coached by Eric Means, one of my former favorite players, who switched after years of assisting Troy Jutting with the Mavericks men to take on the head women’s job a few years ago. Jon Austin, former International Falls and Colorado College star, hired on as assistant. It’s been a tough year for the Mavs, whose deficiencies need improvement at every position. But they try hard. The Friday game started, and UMD’s Audrey Cournoyer scored on a quick rebound of a Haley Irwin shot at 0:45. The Mavericks tied it when Kari Windberg scored midway through the first period, but Shara Jasper puts UMD ahead again, and Cournoyer’s second of the game made it 3-1 after one. Irwin, who assisted on both Cournoyer goals, scored in the second period to make it 4-1. Shots were pretty even, a credit to the Mavericks, but they couldn’t score any more on Jennifer Harss, so the game headed for a 4-1 finish. Cournoyer had a couple chances for a third goal. From the press box, I didn’t realize that Irwin had reached 199 points for her four years at UMD. 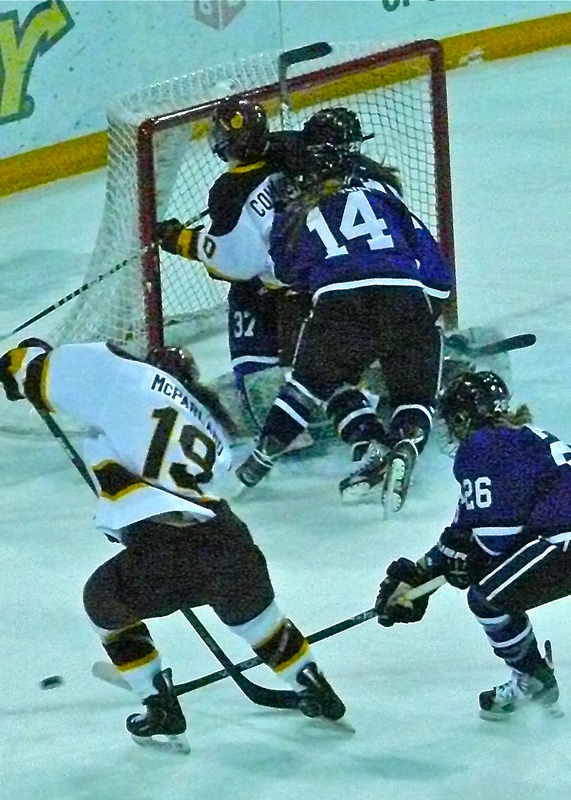 MSU-Mankato defenseman Erika Magnusson (14) shoved Audrey Cournoyer into the goalie as Jenna McParland (19) tried to corral the rebound. In the final minute of play, Shannon Miller called a time out. UMD has had the tendency to lapse this year, and mind-reading from the press box, my thought was that Miller might well be suggesting a strong finish this time, to get into playoff mode. She sent out her first line. 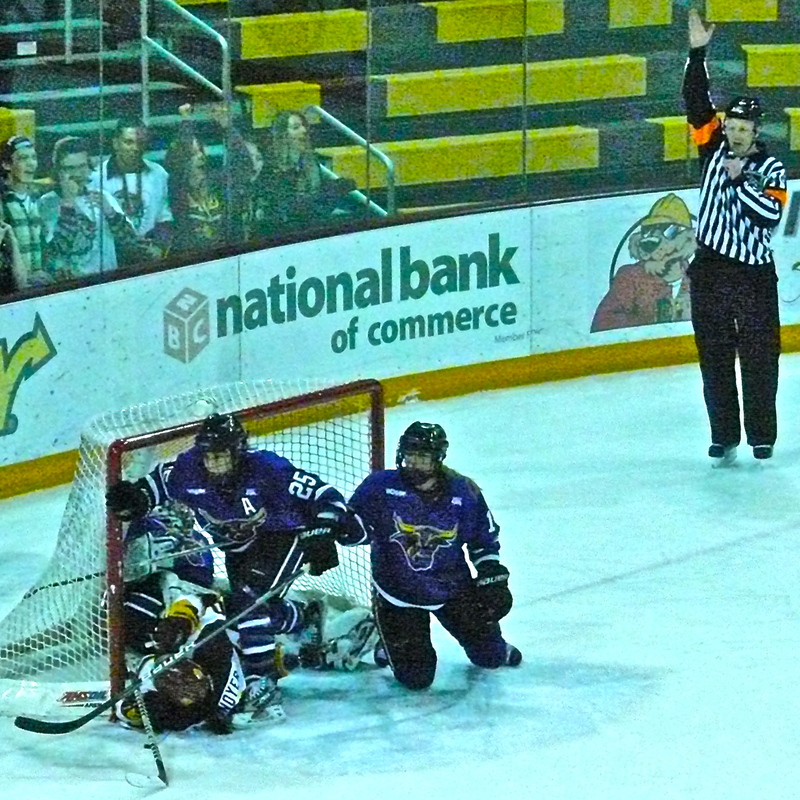 Almost immediately, MSU-Mankato’s Kelsie Scott was whistled for cross-checking. It was a forceful hit, could have been checking from behind, and it put UMD on the power play with 24 seconds remaining. If the plan was to get Irwin her 200th point, or Cournoyer her hat trick, it didn’t seem like a big deal. The clock ticked down into its final 10 seconds, and Irwin rushed with the puck up the left side, where she met some congestion at the left circle. As she slowed, suddenly, Lauren Smith, a junior first-line wing from MSU-Mankato, blasted Irwin, knocking her face down to the ice. The blow was an apparent wildly flung elbow flipper that struck Irwin on the helmet. As Irwin dropped to all fours, Cournoyer picked off the puck — remember the puck? — and darted in from the circle, all the way to the net. She tried to jam in a shot but was stopped. Mavericks defenseman Erika Magnusson shoved Cournoyer over goaltender Alli Altmann, but Cournoyer held her balance. Lauren Smith (25) peeled off after cross-checking Audrey Cournoyer from behind into the crossbar as the clock reached 0:00 in the 4-1 UMD victory. In the next instant, Cournoyer was blown away by a high-speed cross-check from behind, flying helmet-first into the crossbar, and down, as the clock reached 0:00. The two coaches came off their adjacent benches and it was clear they were discussing things in a hostile manner. I have seen Shannon Miller go after people to make a point, and I wondered if that was the case this time. “I came out to shake hands, as I always do,” said Miller. “He said, ‘Nice time-out, you (bleeping) (bleep).” From there, the conversation turned south, apparently. Miller claims that when she expressed outrage that Irwin might be seriously hurt, Means said something like, “Good, I hope she has a separated shoulder.” A photographer stationed nearby, between the benches, pretty much corroborated Miller’s recounting of the situation, although the language was not fit for family consumption. 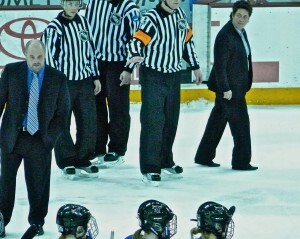 UMD coach Shannon Miller glared at MSU-Mankato coach Eric Means, left, after their volatile post-game conversation. Meanwhile, UMD’s plan was to recognize its top student-athletes after the game, and all those with a 3.5 or higher grade point average lined up on the blue line. That created a bizarre scene: UMD trainer Beth Clute helping Irwin struggle to her feet, and off to the dressing room; game officials huddling by the scorer’s table to figure out the penalties; and the scholar-Bulldogs standing on the blue line, waiting for about 10 minutes. Well, I asked, which is it? Turns out, it was both. Lauren Smith, who had KO’d Haley Irwin with an elbow to the head, then raced to the crease in time to blast Cournoyer into the crossbar. Before I spoke with Miller, I stopped at the much more accessible visiting team corridor and waited. Means and Austin came out, and I renewed acquaintances with two former players who are now old friends, in a private and exclusive interview. Means launched into a mini-tirade; notebook ready, I tried to write it all down. I stopped Means. “Are you kidding? Did you really tell your players to run UMD’s top player?” As it turned out, Smith took out UMD’s top two forwards, which should put her in the WCHA record book somewhere, with two 5-minute majors, a game misconduct and a game disqualification, with her double-barreled attack at 20:00. “I’m proud of her and I wish she could play tomorrow night,” Means said, meaning Saturday’s rematch. Without any knowledge that Means had essentially admitted he sent his players out after UMD’s top stars, Miller was livid. She said she was going to file a report. The WCHA generally sends such reports back to member institutions to enforce any further discipline. It could become a he-said, she-said issue — for those who weren’t in attendance. In my completely private interview with Means, I repeatedly asked if that sort of attack wasn’t something from “the book” of men’s hockey, an ugly part of pro, or junior, or college, or even high school hockey, but which seems out of bounds — way out of bounds — in women’s hockey. The next night, Jamie Kenyon scored twice in the first three minutes for UMD, then Irwin scored on a power play, and celebrated a little extra with her fist pumps, as she headed back toward her bench. On the way, she had to pass the MSU-Mankato bench, and maybe it just seemed like Irwin paused in that vicinity to make sure the Mavericks knew she had gotten her goal, after all. The Bulldogs went on to win 7-1 to complete the sweep, and now it’s on to playoffs. UMD is at home against Ohio State Friday night and Saturday afternoon, and Sunday if necessary, while MSU-Mankato heads for league champ Wisconsin. St. Cloud State is at Minnesota, and an extremely interesting series finds Bemidji State at North Dakota. We can hope that the long-standing difference between the “unwritten rules” of men’s and women’s hockey might return to the women’s normal form, because some traditions just aren’t worth continuing. It’s a shame you don’t have a donate button! I’d without a doubt donate to this outstanding blog! I suppose for now i’ll settle for bookmarking and adding your RSS feed to my Google account. I look forward to fresh updates and will talk about this blog with my Facebook group. Talk soon! Hello! Someone in my Facebook group shared this site with us so I came to check it out. I’m definitely loving the information. I’m book-marking and will be tweeting this to my followers! Superb blog and terrific design. I’m not that much of an internet reader to be honest but your blogs really nice, keep it up! I’ll go ahead and bookmark your website to come back down the road. Cheers. Hi! I’ve been following your web site for some time now and finally got the courage to go ahead and give you a shout out from Atascocita Tx! Just wanted to say keep up the great work! Thanks for the auspicious writeup. It in reality used to be a leisure account it. Look complex to far introduced agreeable from you! You need to get involved in a competition for just one in the finest sites on the web. I will highly recommend this page!